The Conference will be held from June 19th through 21st, 2017 at Laboratoire de Mathématiques J.A. Dieudonné of Université de Nice — Sophia Antipolis in Nice, France. 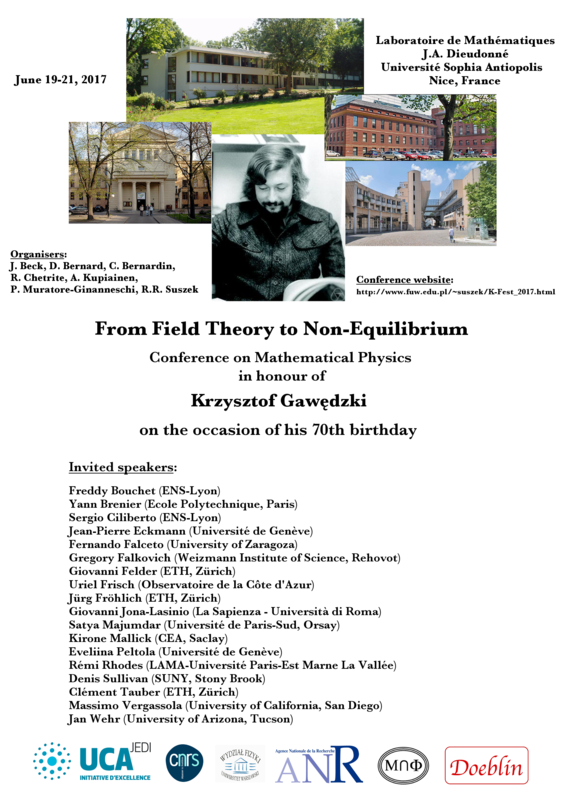 Its main scientific objective is to bring together physicists and mathematicians representing the vast scope of Krzysztof Gawędzki's research interests. In this manner, we wish to honour our long-time collaborator, colleague, teacher and friend. All researchers interested in the topics covered by the lectures of the Conference are welcome. Participants will be lodged at two nearby hotels: Hôtel Monsigny Nice and Hôtel Villa Saint-Hubert. Directions to and from the hotels can be read off from the maps below. On Monday and Tuesday, lunch will be served at the Laboratoire. On Tuesday, on the other hand, we go for lunch to Centre des Finances — Centre des impôts à Nice in 22 Rue Joseph Cadei. The venue of the conference dinner on Tuesday is La Baie d'Amalfi. That of the Monday outing will be specified soon. To those of you who wish to extend their adventure with la cuisine niçoise beyond the conference programme, we suggest an amiable restaurant not far from either of the hotels, amiable and good value for money: Brasserie-Restaurant de L’Union. On Monday, we visit Musée Matisse. I will review some of the recent developments in the theoretical and numerical aspects of the non-equilibrium statistical mechanics of climate dynamics. At the intersection between statistical mechanics, turbulence, and geophysical fluid dynamics, this field involves large-deviation theory, stochastic partial differential equations, homogenization, and diffusion Monte-Carlo algorithms. As a paradigmatic example, we will discuss trajectories that suddenly drive turbulent flows from one attractor to a completely different one, related to abrupt climate changes. More precisely we study rare transitions between attractors, in the stochastic barotropic quasigeostrophic equation. This equation models Jupiter's atmosphere jets. We discuss the mathematical justification of the use of Freidlin–Wentzell theory through averaging, compute transition rates, and instantons (most probable transition paths). As a second example, we will discuss the sampling of extreme heat waves sampled through large-deviation algorithms. Several examples of hidden convexity will be reviewed, including a recent version of the least-action principle for ideal incompressible fluids (which can be interpreted, following Arnold, as a geodesic flow over groups of volume-preserving maps), where it will be shown that the initial-value problem can be surprisingly solved thanks to a convex least-action principle. Inspired by the Euler equations, we construct and study a (3d) random velocity field able to reproduce several empirical facts of turbulence. We then turn back to a (1d) simplification allowing a rigorous study of the various probabilistic objects entering in the construction. When a control parameter of a system is suddenly changed, the accessible phase space changes too and the system needs its characteristic relaxation time to reach the final equilibrium distribution. An important and relevant question is whether it is possible to travel from an equilibrium state to another in an arbitrary time, much shorter than the natural relaxation time. Such strategies are reminiscent of those worked out in the recent field of Shortcut to Adiabaticity, that aim at developing protocols, both in quantum and in classical regimes, allowing the system to move as fast as possible from one equilibrium position to a new one, provided that there exist an adiabatic transformation relating the two. Proofs of principle experiments have been carried out for isolated systems. Instead, in an open system, the reduction of the relaxation time, which is frequently desired and necessary, is often obtained by complex feedback processes. In this talk, we present a protocol, named Engineered Swift Equilibration (ESE), that shortcuts time-consuming relaxations. We tested this protocol experimentally on a Brownian particle trapped in an optical potential first and then on an AFM cantilever. We show that applying a specific driving, one can reach equilibrium in an arbitrarily short time. We also estimate the energetic cost to get such a time reduction. Beyond its fundamental interest, the ESE method paves the way for applications in micro and nano devices, in high-speed AFM, or in monitoring mesoscopic chemical or biological processes. (1) Engineered Swift Equilibration, Ignacio A Martinez; Artyom Petrosyan; David Gury-Odelin; Emmanuel Trizac; Sergio Ciliberto, Nature Physics, Vol 12, 843 (2016). This is work with Andrea Agazzi and Amir Dembo. In it, we find sufficient conditions for a large-deviations principle to hold for networks of chemical reactions. I will explain the structure of such networks, and the main ideas of the proof. We review the asymptotic behavior of the entanglement entropy in the ground state of a free fermionic chain. We emphasize the relevant role that the geometry of Riemann surfaces plays in this subject. On the one hand, we recall well-known results from conformal field theory to determine the behavior of the entanglement entropy under conformal transformations. On the other hand, we unravel a new symmetry for the entropy in non-critical theories, which is based on the Möbius transformations in momentum space. We argue how to extend these results to critical theories and support our conjectures with numerical tests. Finally, we highlight the intriguing parallelism that exists between conformal symmetry in real space and Möbius transformations in momentum space, exchanging the insertion points for the Fermi momenta. Quantum-critical strongly correlated systems feature universal collision-dominated collective transport. Viscous electronics is an emerging field dealing with systems in which strongly interacting electrons flow like a fluid. We identified vorticity as a macroscopic signature of electron viscosity and linked it with a striking macroscopic DC transport behavior: viscous friction can drive electric current against an applied field, resulting in a negative resistance, recently measured experimentally in graphene. I shall also describe current vortices, expulsion of electric field, conductance exceeding the fundamental quantum-ballistic limit and other wonders of viscous electronics. Strongly interacting electron-hole plasma in high-mobility graphene affords a unique link between quantum-critical electron transport and the wealth of fluid mechanics phenomena. In the Lagrangian representation, fluid particles are characterized in terms of the time-dependent Lagrangian map, which sends the initial position (a,b,c) of the fluid particle to its current position (x,y,z). This is of obvious interest in following tracers (balloons, buoys, pollutants, etc.) in geophysical flow. But is also at the core Arnold's (1966) formulation of incompressible Euler flow as geodesics of SDiff, the set of volume-preserving diffeomorphisms. Actually, the Lagrangian properties of the flow tend to be much nicer than their Eulerian counterparts. For example, they have time-analytic trajectories with only limited smoothness of the initial data. Major work on the Lagrangian description was done by Cauchy (1815) and Hankel (1861). Cauchy discovered invariants which extend to 3D the well-known 2D theorem of conservation of vorticity for ideal incompressible fluid flow. Hankel's Prize manuscript contains major discoveries: the first variational formulation in terms of the Lagrangian map for barotropic flow, the first derivation of the conservation of circulation, the first fully Lagrangian approach to the Helmholtz vorticity theorem and to the description of flows in terms of Clebsch variables. As Riemann wrote in his report on Hankel: "all manners of good things." Frisch, U. and Villone, B., "Cauchy's almost forgotten Lagrangian formulation of the Euler equation for 3D incompressible flow", Europ. Phys. J. H39 (2014) 325—351; arXiv:1402.4957 [math.HO]. Frisch, U. and Zheligovsky, V., "A very smooth ride in a rough sea", Commun. Math. Phys. 326 (2014) 499— arXiv:1212.4333 [math.AP]. Zheligovsky, V. and Frisch, U., "Time-analyticity of Lagrangian particle trajectories in ideal fluid flow", J. Fluid Mech. 749 (2014) 404— arXiv:1312.6320 [math.AP]. Rampf, C., Villone, B and Frisch, U., "How smooth are particle trajectories in a Lambda CDM Universe? ", Mon. Not. R. Astron. Soc. 452 (2015) 1421—1436; arXiv:1504.00032 [astro-ph.CO]. Podvigina, O., Zheligovsky, V. and Frisch, U., "The Cauchy–Lagrangian method for numerical analysis of Euler flow", J. Comput. Phys. 306 (2015) 320–342; arXiv:1504.05030v1 [math.NA]. Besse, N. and Frisch, U., "A constructive approach to regularity of Lagrangian trajectories for incompressible Euler flow in a bounded domain", arXiv:1603.09219v1 [math.AP]. Besse, N. and Frisch, U., "Geometric formulation of the Cauchy invariants for incompressible Euler flow in flat and curved spaces", preprint 2016. I will discuss an approach to the foundations of quantum mechanics based on a precise definition of the notion of an "Event", (the importance of which has been emphasized by the late Rudolf Haag). A fundamental ingredient of this approach is the property of "Loss of Access to Information", as time goes by. On the basis of this property, I will discuss what quantum mechanics predicts about the occurrence of events. The notion of an "instrument" will be introduced, and it will be explained how instruments serve to observe events. The stochastic nature of the evolution of states — as opposed to "observables" — in quantum mechanics and its fundamental irreversibility will be illuminated. The discussion results in the so-called "ETH approach to quantum mechanics", where "ETH" stands for "Events, Trees, and Histories". After considering possible directions of development in SSPDE viewed as stochastic dynamical systems, I will examine fluctuating hydrodynamics from the standpoint of SSPDE and discuss to what extent the equations arising in fluctuating hydrodynamics are covered by the present mathematical theory. We study a simple model of search where the searcher undergoes normal diffusion, but once in a while resets to its initial starting point stochastically with rate r. The effect of a finite resetting rate r turns out to be rather drastic. First, the position of the walker approaches a nonequilibrium stationary state at long times. The approach to the stationary state is accompanied by an interesting `dynamical' phase transition. For searching an immobile traget, resetting leads to finite mean search time which, as a function of r, has a minimum at an optimal resetting rate r*. This makes the search process efficient. We then consider various generalizations of this simple resetting model: to Levy flights and to non-markovian models with resetting and memory. We derive the exact formula for the large deviations of a tracer in the one-dimensional symmetric simple exclusion process. This formula yields all the cumulants of the tracer position in the long-time limit. Our results are valid for a system prepared out of equilibrium, with a step density profile, the tracer being initially located at the boundary. The fluctuations of the tracer's position at equilibrium, when the density is uniform, are obtained as an important special case. The solution is obtained using the powerful techniques of integrable probabilities, developed recently to solve the one-dimensional Kardar–Parisi–Zhang equation. Joint work with Takashi Imamura (Chiba) and Tomohiro Sasamoto (Tokyo). I discuss correlation functions of CFT related to geometrical problems in critical statistical-physics models. Since Cardy's formula for percolation, such observables have become crucial tools in the rigorous study of scaling limits of critical lattice models. They can be used to classify multiple SLE (Schramm–Loewner evolution) processes, that are expected to be scaling limits of interfaces in critical planar-lattice models. In certain cases, explicit formulas for the crossing probabilities are known. I briefly discuss the c=-2 case: multiple loop-erased random walks (LERW); and the c=1 case: the double-dimer model and the level lines of the Gaussian free field (GFF). Also for general central charges c≤1, these formulas are certain explicit linear combinations of the conformal blocks of CFT. 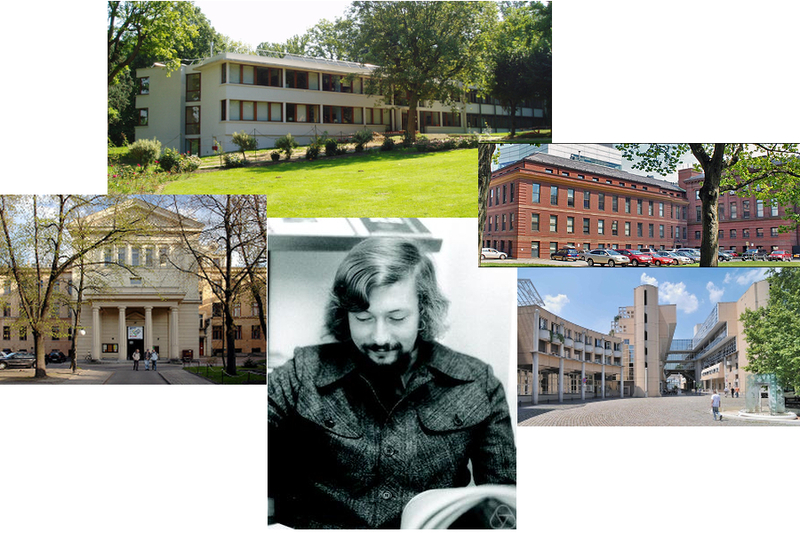 The talk is based on various joint works with Steven Flores (Aalto University, Helsinki), Alex Karrila (Aalto University, Helsinki), Kalle Kytölä (Aalto University, Helsinki), and Hao Wu (University of Geneva / Yau Matihematical Sciences Center, Beijing). We use the partition function of the Liouville quantum field theory to give a mathematical sense to Polyakov's partition function of noncritical bosonic string theory (also called 2d bosonic string theory). More specifically, we show the convergence of Polyakov's partition function over the moduli space of Riemann surfaces with fixed genus in the case of D boson with D less than 1. This is done by performing a careful analysis of the behaviour of the partition function at the boundary of moduli space. An essential feature of our approach is that it is probabilistic and non-perturbative. The interest of our result is twofold. First, to the best of our knowledge, this is the first mathematical result about convergence of string theories. Second, our construction describes conjecturally the scaling limit of higher-genus random planar maps weighted by the discrete Gaussian free field. This will be between physics and mathematics. We will formulate a method to study fluids using familiar models from statistical mechanics and thermodynamics. Then we follow a mathematical path to some positive statements, using experimental evidence to assert the truth of certain (unproved) lemmas along the way. In the context of topological insulators, it was recently realized that topological phases can be engineered through a time-periodic perturbation of a material, even far beyond the adiabatic limit. In this context, sometimes called Floquet topological insulators, I would like to define two topological invariants for a two-dimensional sample. One associated to the bulk of an infinite system and one associated to the edge states of a half-infinite system. After discussing their physical interpretation, I will show that these two invariants actually coincide. This generalizes the crucial concept of bulk-edge correspondence, that appears in the quantum Hall effect and all its extensions, to periodically driven systems. Extra symmetries and (weak) disorder can also be implemented here. Early embryogenesis of most metazoans is characterized by rapid and synchronous cleavage divisions. In Drosophila embryos, waves of activity of Cdk1, the main regulator of the cell cycle, are responsible for the synchronization of cell divisions. After reviewing the phenomenology, I shall discuss the dynamics of the Ginzburg–Landau model that captures the in vivo dynamics of Cdk1. The main feature of the corresponding potential is that it features a time-dependent component, which accounts for the growing level of Cdk1 activation across the cell cycle. Two distinct regimes result. The first regime is experimentally observed in mutants that alter the regulation of the mitotic switch. In the resulting quasi-adiabatic regime, waves reflect the classical physical mechanism of invasion by a stable state of a metastable one. Conversely, the quasi-adiabatic approximation is violated in wild-type embryos, where the observed waves reflect the sweeping of spatial gradients of the Cdk1 field by the time-dependent component of the potential. This alternative mechanism leads to wave-like spreading, which is faster and depends on the dynamic parameters differently than bistable waves. For instance, the latter scale as the square root of the Cdk1 molecular diffusivity and weakly depend on the amplitude of the noise, whilst the former scale as 3/4 and 1/2 powers, respectively. Theoretical predictions are supported by experiments that couple quantitative measurements of Cdk1 and genetic perturbations. Active Brownian particles, also known as microswimmers, display interesting patterns of behavior. I am going to discuss properties of such particles which randomly change the direction of their motion, while responding in various ways to inhomogeneity of its surroundings. For example, they move faster or slower, depending on the local intensity of light. If the particle's response to the environment is delayed, properties of its motion depend sensitively on the magnitude of the delay. Most interestingly, the delay can be negative, i.e., a microswimmer may be predicting the future, based on the past and the present. Such negative delay occurs in some bioparticles, and can also be engineered in robots. It is observed experimentally that at some value of the negative delay, motion of a microswimmer undergoes a qualitative change. I will present a theoretical explanation of this phenomenon and discuss its implications for collective behavior of microswimmer swarms. This is an ongoing project with Giovanni Volpe, involving several graduate students. (1) G. Volpe, J. Wehr, "Effective drifts in dynamical systems with multiplicative noise: a review of recent progress", Reports on Progress in Physics 79, no. 5 (2016). (2) M. Mijalkov, A. McDaniel, J. Wehr, G. Volpe, "Engineering sensorial delay to control phototaxis and emergent collective behaviors", Phys. Rev. X 6, 011008 (2016). (3) "Focus: Sensing Delays Control Robot Swarming", American Physical Society Focus, January 29, 2016.
in the PNG format is available under this link. In case of further questions or remarks, do not hesitate to send an e-mail to Raphaël Chetrite <rchetrit at unice.fr>.